On the horizon, from the left, are Graystones and Broom Fell; a trace of the distant Brae Fell; the noticeable crest of Lord's Seat; Little and Great Sca Fells and Skiddaw. 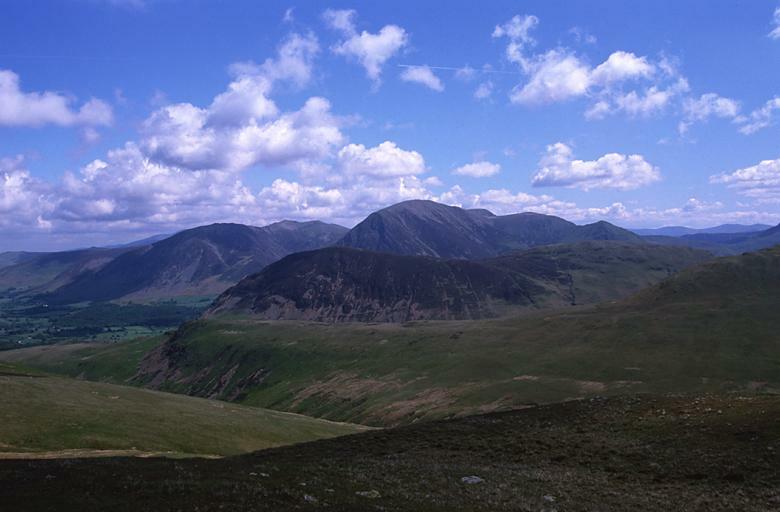 Whiteside, Hopegill Head and Sand Hill are prominent; then Grasmoor, Eel Crag Wandope and Whiteless Pike are seen beyond the saddle of Mellbreak in the middle distance. On the right, on the horizon, lie Watson's Dodd; Stybarrow Dodd; the gap of Sticks Pass; Raise and White Side. The nearby fell on the right is Hen Comb. Smaller version of this picture.